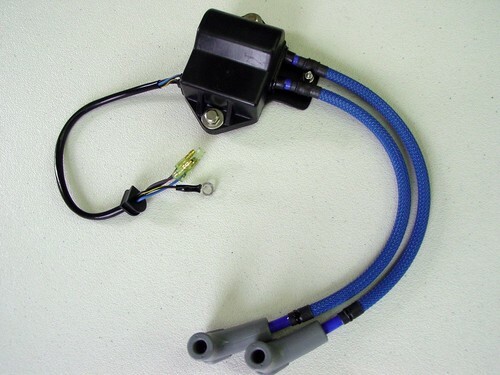 JetSki Solutions proprietary spark plug wire replacement system for Kawasaki 650 igniter.. Most of the time, worn faulty spark plug wires and terminals/ boots are the only problem with the igniter. Price shown applies to all model variations. Cables can be made to any length, great for custom engine swap jobs!! We use high performance 8mm stranded tinned wire core silicone spark plug wire. 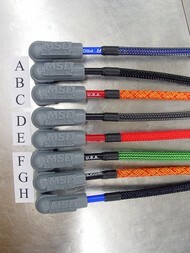 Available in black, red and blue with various braid colors or black OEM type neoprene tubing cable protection available. PURPLE AND ORANGE braid now in stock !! The entire input wiring harness is replaced with higher quality larger gauge wiring with new connectors for X2 models with long harness. Other shorter type harnesses receive new connectors and wiring if required. Note the special plate that is added to clamp the wires in place to prevent future damage due to shaking plug wires. PLEASE NOTE this service replaces worn, open, or too short plug wires only. We can not fix faulty internal electronics. We test for correct secondary resistance only.